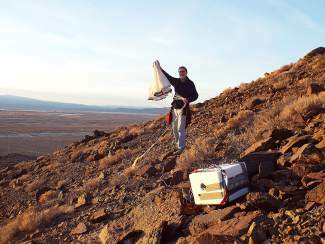 Rich Williams with Space Science for Schools assists in the recovery of the balloon outside of Yerington, Nev. It was a nice sunny Wednesday in January at the Village Green. I heard birds chirping, the wind blowing, and a stream flowing. I think it was a good day to do what we did because of the calm winds — we launched a weather balloon! All three third grade classes from Incline Elementary School were there, as well as Space Science for Schools and some parent volunteers. We launched about $1,500 worth of equipment in our payload, and we might not have gotten it back! A lot of students were thinking how nerve-wracking it would have been to lose $1,500 worth of equipment. We did a few tests in the classroom ahead of time, like testing if the parachute would work or not. For another test, we checked if the GPS would work — our teacher hid one GPS, and we found it with another one. We have been studying a lot of science and engineering about the weather balloon. For example, we studied about mass and thought about the weight we were sending up into the atmosphere. We couldn’t have too much weight because the helium and payload needed to be balanced. Did you know that 1 cubic foot of helium lifts 1 ounce? In the third-grade weather balloon launch, we used 110 cubic feet of helium! We worked on a lot of other projects using the weather balloon, like what we were sending into the atmosphere. In our payload, we sent a UVB sensor, a GoPro for taking video, a camera, two GPS devices, and a thermometer. We also sent up three types of seeds, radish, corn, and beans. We used them for a class science experiment to see if the seeds that went up in the atmosphere grew the same as the seeds that stayed at IES. When we got back to the classroom, we tracked the weather balloon online with a tracking device. We saw an aerial view of the balloon’s travel, and we got to see a jet stream of wind that the balloon got caught in. We sent a chase crew to go find the balloon. The chase crew searched for hours and almost gave up. Finally, they saw something white on a mountain, so they ran up and got it. We discovered that the balloon went 105,846 feet high and it ended up 50 miles away, east of Yerington Nev., on a hillside. Our balloon had started at eight feet in diameter, and it expanded to 30 feet in diameter; we also found out that it witnessed -60 degree temperatures! This was a really cool project and a fun experience for me, as I learned a lot about weather balloons, and our class won first place in the Science Fair. I also want to say a big thank you to Space Science for Schools for walking us through this whole project. 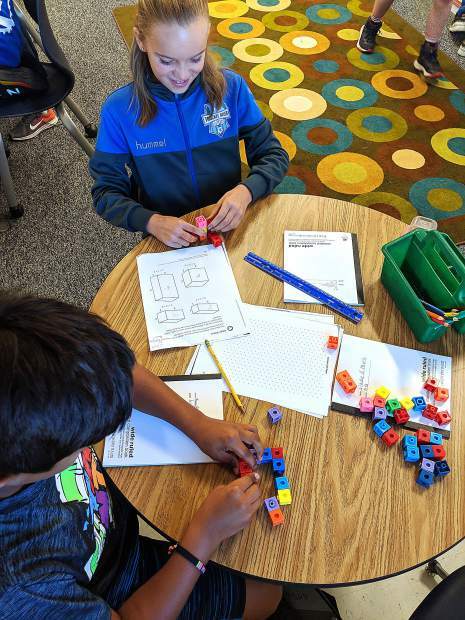 Liam Ellis is a third-grade student in Eric Harssema’s science class at Incline Elementary School. This article was the essay he wrote for his class after the balloon launch. Visit ss4s.org to learn more about Space Science for Schools.